With less than a week left in Salalah, I find myself daily taking stock of this most recent experience. Today was my last day of work, tonight is my last Thursday night at Oasis, Monday is my last rugby practice. Back in February, after being here for over 4 months, I finally figured out where I fit in in Salalah, and finally started embracing and enjoying my life here. I’ve mentioned it a few times before, mostly to prove to myself that I can actually be somewhere for longer than 3 months, but I’ve lived in Salalah longer than I’ve lived anywhere in the world in the last 4 years. I have really grown to love my life here, it is rich and full and mostly because of a team, because of a game. My work has always been very important to me, and is usually very fulfilling. Something about my long drives and two shallow dives a day here in Oman left me wanting a lot more than just work/eat/sleep. I had energy I needed to expend, discussions I wanted to have with people who actually spoke my language. I knew it would be a long season, and after a month or so of being in Salalah, I was already wondering how I would make it through. Chatting to a few of the local expats here on Hallowe’en, they suggested that I come out and play with the local rugby team, the Dhofar Nomads. The men’s rugby team. I was hesitant. I might look all fit and tanned and healthy, but I’m still pretty skinny-fat . . . and I basically had no idea how to play. Eimear (the other female Nomad) said that she ran around while they did tackle drills, and joined in for the warm up and running parts . . . I figured I could manage that, and so on November 3rd, I walked into the big field in Salalah to give it a try. Very fuzzy picture because I was too embarrassed that I was even taking one picture to take another! I loved every second of that first practice. I loved the running, and the sweating, and the push ups, and the sprints, and the throwing, and the catching . . . I just loved it. Somehow my brain remembered that in Grade 8 we had played rugby for two weeks, and Mr. McDonald had taught us all how to throw a rugby ball: with spin, and always, always backwards from the direction of play. Slowly (very slowly) I’ve learned more of the rules, how to move the ball across the pitch, and of course towards the try line. I’ve learned the lingo (switch, right shoulder, deep, pop . . .) and how to communicate with my team mates while running plays during our mini-games at the end of every practice. But most of all, I’ve made friends. Good friends. Friends to go to the beach with, or have a drink with, or have dinner with, or go camping with, or go bowling with . . . or even help you get your Omani drivers license!! Friends who are caring and supportive and who ask you how your day was and really mean it. In the last six and a half months, I’ve missed one practice: because I was in another country. I didn’t actively participate in two other practices (I had a cold once and my toe was broken the other time), but I still went. I needed to. 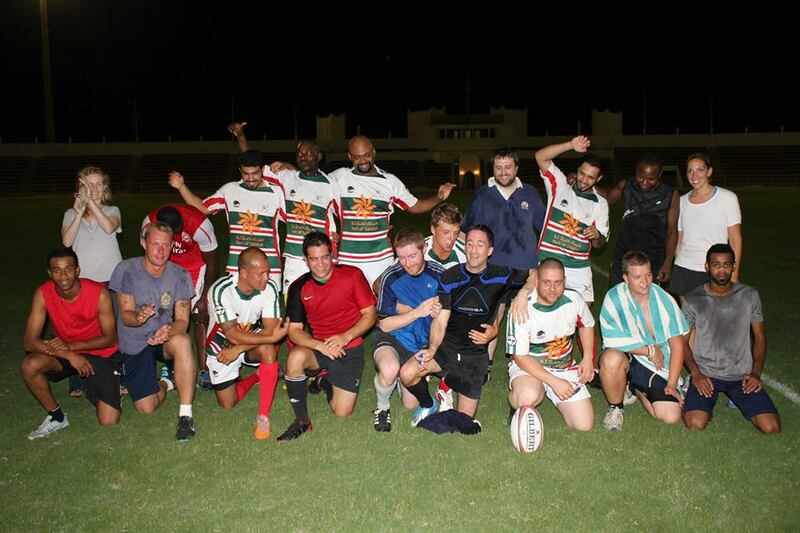 Rugby has been my game-changer in Salalah. No matter how broken down, how defeated, how tired, how upset I’ve been after a day at work, I went to practice. Even on the toughest days, all I had to do was get changed and drive to the pitch – once I was there, the practice was easy; almost instantly I felt better. The worries of the day erased by running, and drills, and burpees, and always a good laugh with smiles all around. After the Nomads vs Nomads match, March 2014: Sweaty, happy, smiling and no one is really paying attention – typical Nomads! These boys, and Eimear, have given me a sense of belonging I haven’t had in years. It was this feeling of belonging to something far bigger than myself that really made a change in my life in Salalah. It gave me the confidence boost that I needed to realize that I’m more than just my job, my work, more than just a divemaster. I can have a life outside of diving, and achieve a balance of work/play time if I only put in a little bit of effort. I’ve shared experiences and made memories with these friends that I will never forget. I’ve got one more practice left. One more chance to prove to the boys and to myself that I can play. One more chance to let them know how much they mean to me. One more chance to have a few beers and a few laughs with the friends that have made all the difference to me here. So thank you, Nomads, thank you for just existing, and for being your amazing, wonderful selves. Until next time . . . 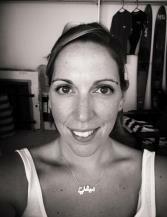 This entry was posted in Diving, Exercise, Friends, Oman and tagged belonging, Dhofar Nomads, divemaster, diving, DM, expat, friends, Oman, rugby, rugby 7s, Salalah, travel, travelling, work/life balance. Bookmark the permalink.